LRP A.i. 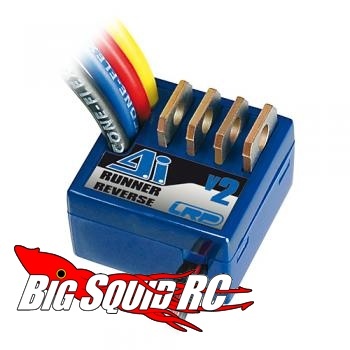 Runner Reverse Version 2 « Big Squid RC – RC Car and Truck News, Reviews, Videos, and More! It looks like LRP has an update to their A.i. Runner Reverse ESC This is a legendary ESC that features a no-button setup! Just plug it in and you’re off and running. I can’t tell you how much I appreciate that. I can never remember the setup instructions on my of my ESCs. There is nothing more frustrating than being out somewhere and not having the write-up on your ESC if you need to reprogram. It is now 100% waterproof, features a fail-safe that stops your vehicle in the event of running out of radio range, and an on/off switch. It should be available anytime for around $70. I’ve got to say, I love all these MFGs getting on the waterproofing kick! Be sure to hit up LRP for all the info.